Moverbase is the best moving company system, while QuickBooks is the most popular accounting system for small and medium size businesses in the world. Most moving companies use QuickBooks for their accounting. Needless to say, we are building the framework of a powerful integration together. You must have a paying Moverbase account, or you must upgrade to one. You must have an active QuickBooks online account. A Service Account or Sales Account set up to capture your line item charges and refunds incomes. An Undeposited Funds account to capture all the Payments Deposits & Refunds Deposits. QB generally sets this up by default. 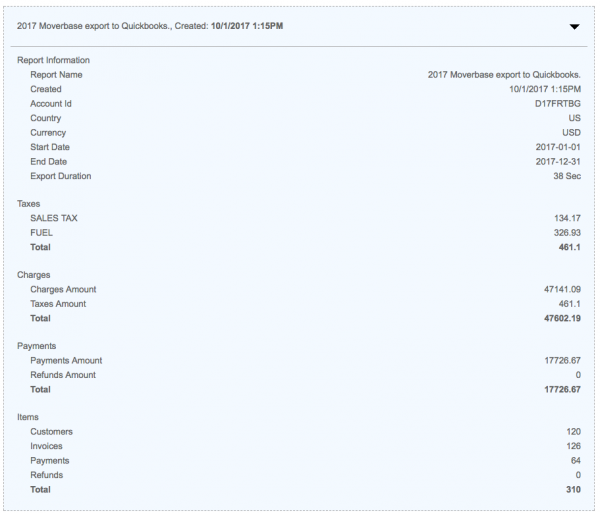 Set up all your taxes in QuickBooks that mirror the taxes you have set up in Moverbase if you have any. Otherwise, this will result in an export error. 6. 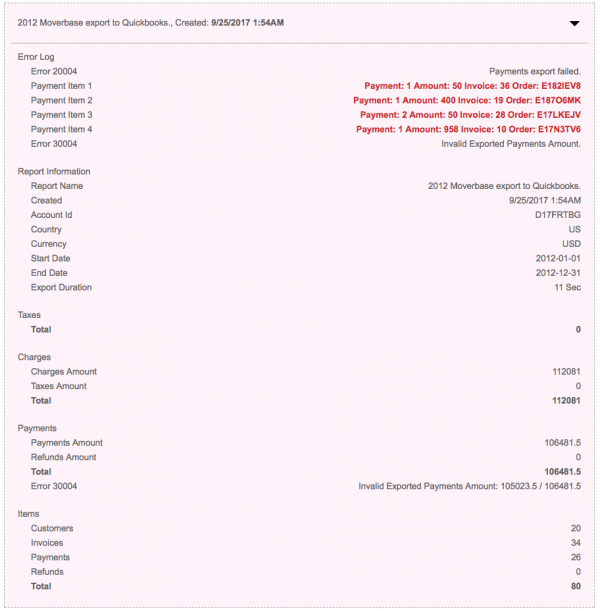 To export your Moverbase invoices, simply click on the Export button. 7. Select the timeframe of the export: Year, Month or quarter and Begin Export. 8. You will be put into queue to prepare for the export and will receive a notification once it is complete. 9. Upon completion of the export, you will see a detailed export report like this one. Please look at it to make sure it seems accurate. 10. To verify the success of the export, search for an Invoice Number in your QuickBooks account for the export period. You should see the invoice in QuickBooks. Important Note: QuickBooks integration is very complex with lots of moving parts, so being meticulous will avert any errors. Repeat process above to correct any error. Voila!! Miracles happen. Integrating with behemoth applications such as QuickBooks takes an incredible amount of effort, and this is the first version. We will improve it as we get feedback from you and the system.